Investment in public space and a mix of uses boosts expenditure in town centres. Retail theory has it that the longer the consumer spends in a store, the more likely they are to increase their spending. Can the same be said for dwell time in our town centres? If we create the kind of public spaces and mix of uses that increases the amount of time people want to spend there, will this have a positive effect on spending in stores and with local businesses? What is the evidence for such a claim? There is a growing body of evidence that suggests people’s experience when they visit a town centre, as well as who they visit with, determines the amount of time spent (dwell time) and how much they spend. Recent evidential studies and observations of people’s experiences suggest that visiting a town centre as part of a group (two or more people) can boost expenditure by as much as 50%. The opportunity for social interaction causes people to dwell for longer in town centres and as a consequence they are likely to spend more. Introducing a broader mix of leisure, dining, arts and cultural uses to town centres, alongside hosting events, provides the right conditions for increasing social interaction and dwell time. The quality of public realm and the environment clearly plays an important role in encouraging people to interact and spend more time in town centres too. International evidence also shows that restricting vehicular access to city centres as part of low emissions zones can actually boost business takings. For example the temporary closure of Madrid’s Central Business District to traffic over Christmas 2018 was found to result in a 9.5% increase in store takings on the Gran Via main shopping street (Source: Madrid City Council - “Madrid Gran Via Christmas Spending Effects 2018/19”). This may provide some comfort to policy makers in the UK as they seek to grapple with the twin challenges of town centre regeneration and clean air. Manchester’s ambition for its public spaces has been elevated in recent years. The pivot point was the redesign of St Peter’s Square (pictured). The square, once bisected by roads and heavy Metrolink infrastructure was a place to pass through rather than spend time in. 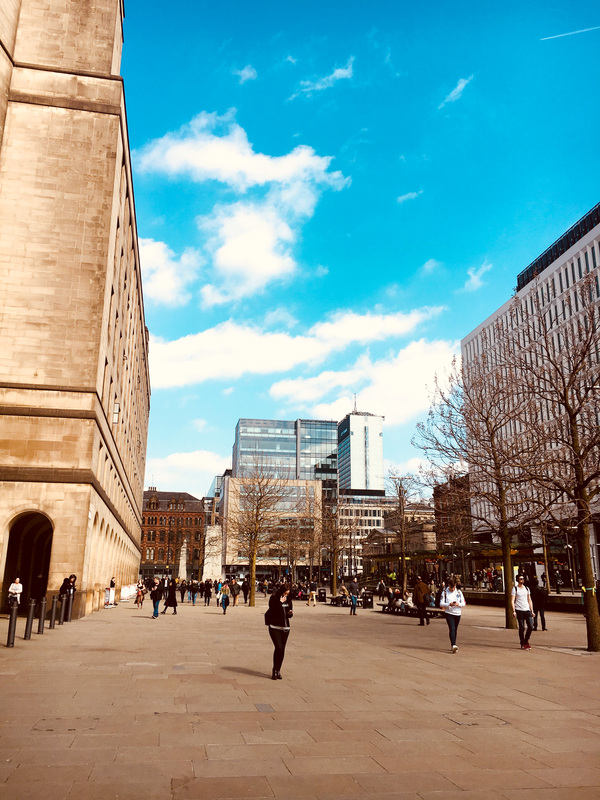 It has been completely transformed through pedestrianisation, robust materials, new public art, landscaping and careful ongoing place management by Manchester City Council. People now throng the square and visibly enjoy spending time there. It is perhaps no surprise that all of the new food and beverage premises lining the square were quickly occupied and appear busy. This approach to rethinking public space is being applied to other areas of the city centre. In the future we can look forward to the redesign of Albert Square including pedestrianisation and a 20% increase in the size of the square. Elsewhere there are proposals for closing Thomas Street, located in the thriving Northern Quarter of the city centre, to vehicular traffic on weekend nights and bank holidays. These improvements will create “pedestrian dominated” places in which people will want to dwell for longer. The evidence suggests that the creation of such spaces for social interaction can only be good for business. If we create the kind of public spaces and mix of uses that encourage people to dwell for longer our town centres will prosper. Investment in the public realm, ongoing place management, “curation” of spaces and allowing our town centres to evolve into mixed use places are all fundamental to their future success. For more information on how to successfully introduce a vibrant mix of uses in to town centres see our Making Sense of Mixed-Use Town Centres report available here. For details of our involvement in delivering the new statue of Emmeline Pankhurst in St Peter’s Square, Manchester see here. If you have any questions relating to mixed-use town centres, please contact Richard Laming.